COLUMBUS, Ohio — Elvis was in the building. Or at least a University of Tennessee fan dressed like The King. He looked ready to wipe the sweat of relief from the sleeve of his white jumpsuit. It ain’t easy being a fan of the chronically underachieving Volunteers basketball team. Friday’s drama: No. 2-seed Tennessee surviving an upset-bid by No. 15 Colgate, winning 77-70 at Nationwide Arena in Columbus. The Volunteers (30-5) advanced Sunday’s second-round game against No. 10 Iowa (23-11). After a stressful NCAA Tournament opener, Elvis might have reason to smile. No. 15 seeds have toppled a No. 2 eight times. Most recently, it happened in 2016 in St. Louis when No. 15 Middle Tennessee stunned No. 2 Michigan State. The seeding was probably unfair in that one. That matchup probably shouldn’t have happened. Middle Tennessee was significantly better than your typical No. 15, and Michigan State arguably should’ve been a No. 1 seed. The seeding here was legit. Colgate, the Patriot league champion, looked like a No. 15 seed when it fell behind 9-0. Tennessee looked like a No. 2 when it rolled out to a 36-20 lead. But Colgate clawed back and took a 52-50 lead with 11:35 left. 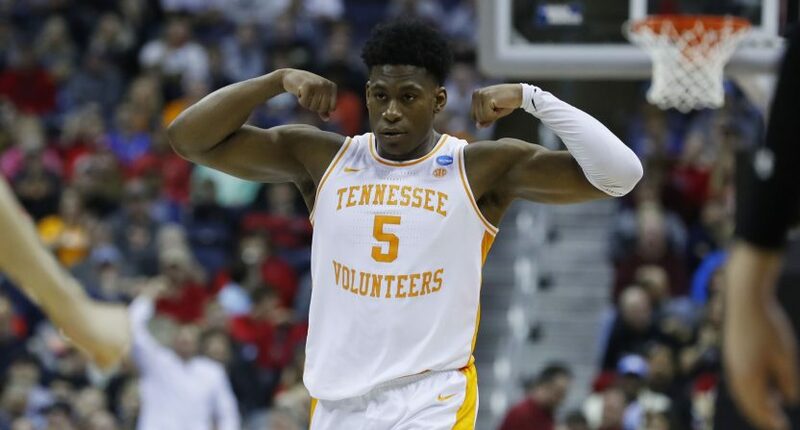 But back-to-back three-point baskets from Admiral Schofield put Tennessee in control 73-64 in the final minute. The bracket got a little easier for Tennessee. Iowa’s victory over Cincinnati means that Sunday’s game will have more of a traditional neutral-site feel. In the earlier game at Nationwide Arena, the crowd was 70 percent Bearcats fans. It might have 80 percent on Sunday if Cincinnati won. These aren’t your father’s Volunteers. These aren’t even your older brother’s Volunteers. This might be the most legitimate shot the program has ever had to reach its first Final Four. Before former Tennessee coach Bruce Pearl got caught lying to the NCAA and was hit with a show cause penalty, Pearl had Tennessee on the verge. The Volunteers were a game away before succumbing to Michigan State in the 2010 Elite Eight. Why should we trust Tennessee? Fair question. Tennessee has proven itself all year. The Volunteers had a 19-game winning streak and were the No. 1 team in America for three straight weeks. They’ve beaten Gonzaga and Kentucky (twice). They don’t have a bad loss: Kansas (in overtime), at Kentucky, at LSU, and twice to Auburn. The NCAA selection committee has also done Rick Barnes a favor. The South is the easiest regional. There’s a possibility that the Volunteers won’t have a serious threat to beat them until they reach the regional semifinals, likely against top-seed Virginia. And as we all know, Virginia has its own demons to purge. If that matchup happens, Tennessee has the best offense that Virginia has faced this season. The Volunteers are third in the nation in offensive efficiency, trailing only Gonzaga and Virginia. Getting Tennessee to the Final Four would be sweet redemption for Barnes. There aren’t too many people walking around who have coached different programs to the national semifinals. And when you consider that Barnes could do it at football-first schools, that would be even more impressive. We get it. Barnes flatlined at Texas. His first 10 seasons at Texas were impressive: three Elite Eights and the 2003 Final Four. But the final seven were unremarkable; the Longhorns never got past the second round. Texas pushed Barnes out in 2015 and replaced him with one of the hottest coaches in the nation. Shaka Smart took VCU to the 2010 Final Four. Surely, he would have success with Texas’ financial resources and rich recruiting base. Funny how life works. Smart has been a colossal disappointment, failing to win an NCAA Tournament game and missing the tournament twice in four seasons. Meanwhile, Barnes, after a rough first two seasons, has Tennessee trending in the right direction. The Volunteers were 26-9 with a first-round victory last year before being stunned by a Loyola-Chicago team that went to the Final Four. This year, this is as complete a squad as the program has ever had. Junior forward and SEC player of the year Grant Williams is one of the five best players in the country. Tennessee is also balanced with four double-figures scorers. If you slow down Williams, you must deal with Schofield or Bone. Colgate limited Williams to nine points on six shots. But Schofield (19) and Bone (16) chipped in. As Elvis sung, it’s now or never.